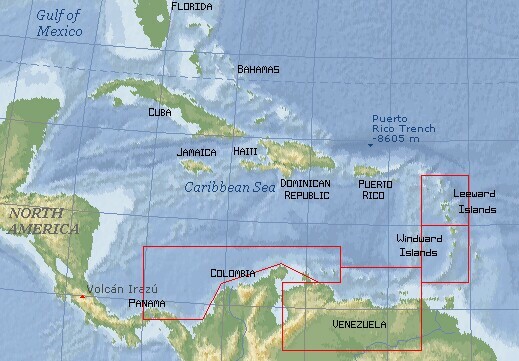 Below you will find additional maps with more detail on each of the areas that we went to in the Caribbean. 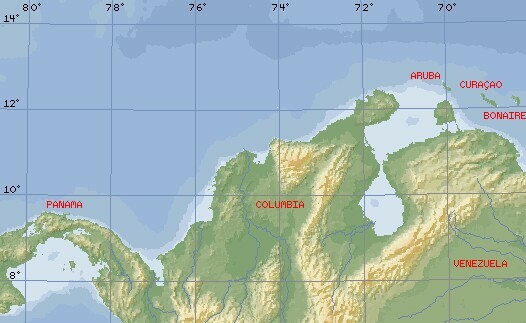 In general, we started at the top of the Leeward Islands in the Eastern Caribbean, sailed down through the Windward Islands, across to Venezuela, and then continued west (downwind, of course) to the San Blas Islands of Panama. Click on the map to go to that area of the website. The Eastern Caribbean was our playground for much of 2002. We started in St. Martin, in the upper left corner of the map, and basically zig-zagged up and down the chain. We skipped Antigua and Barbuda as they are upwind of the rest of the chain, making them more difficult to get to. For the purposes of this website, we've divided the islands into the Leeward (northern) and the Windward (southern) Islands. These names have been used for centuries as the tradewinds usually blow from slightly south of east. The Eastern Caribbean was all old cruising grounds for Jon and Sue as they'd spent 6 years here in the '80s, but it was all new to Christopher and Amanda and the many visitors who came down to meet us. Click on the islands to the right to go to that part of the website. A note on History. The pre-European history of the Eastern Caribbean islands all follows a similar story. The earliest inhabitants were the Arawaks, a peaceful farming and fishing peoples from South America who arrived by canoe several thousand years ago. Following the Arawaks, came the more war-like Carib Indians who attacked Arawak villages, killing and eating the men and enslaving the women. It was the Caribs who either repelled or welcomed the earliest European visitors (including Columbus). Most of the Carib people were either killed or died of European diseases by the end of the 18th century. Today only a few Carib settlements remain in the eastern Caribbean, on the islands of Dominica and St. Vincent. In Venezuela we spent most of our time on the duty-free island of Margarita, using it as a base from which to explore Coche, the Golfo de Cariaco (the big gulf just south of Coche) and inland Venezuela. When we left Margarita just after Christmas 2002 we sailed through Tortuga, Los Roques, and Las Aves. Click on the map to bring up a larger and more detailed map of Venezuela and her offshore islands, with hot-links to the various places we visited. In Bonaire we stopped to check out the coral in the amazingly clear water, which prompted us all to get our SCUBA certifications. We also visited Curaçao, the "C" in the ABCs. From there, we started our first multi-day passage, a sleigh ride through the nastiest bit of water in the Caribbean. After four harrowing days, we arrived in the beautiful San Blas Islands and shortly thereafter transited through the Panama Canal, to the Pacific! Click on the map to go to our Southwest Caribbean pages.